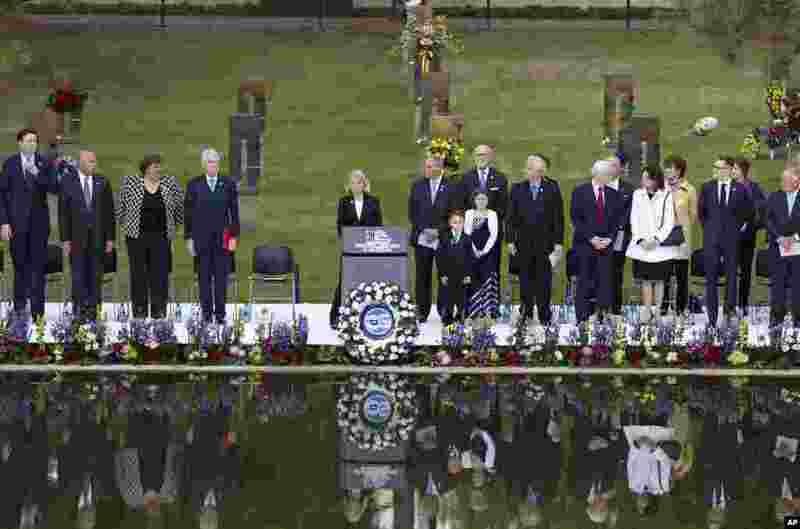 1 Speakers, including former President Bill Clinton, fourth from left, stand at the opening of ceremonies to commemorate the 20th anniversary of the Oklahoma City bombing, at the Oklahoma City National Memorial, in Oklahoma City, Sunday, April 19, 2015. 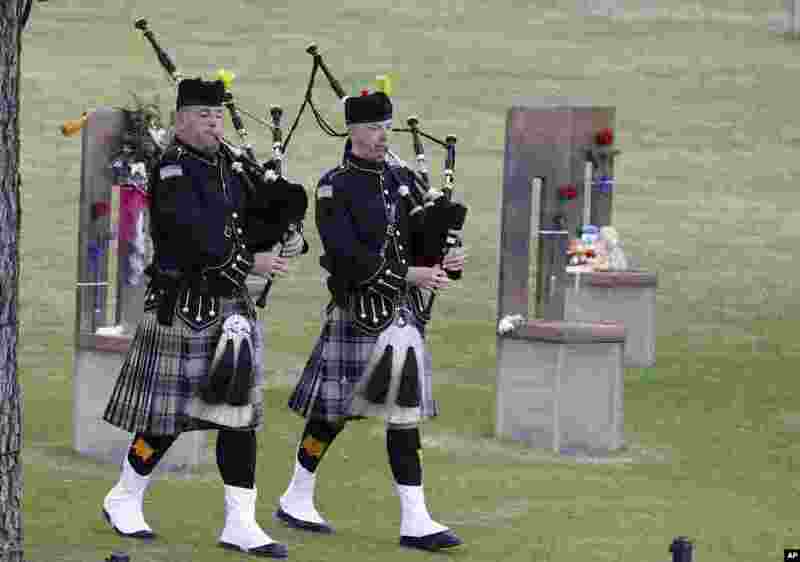 2 Bagpipers walk through the Field of Empty Chairs at the Oklahoma City National Memorial at the start of ceremonies to commemorate the 20 year anniversary of the Oklahoma City bombing in Oklahoma City, April 19, 2015. 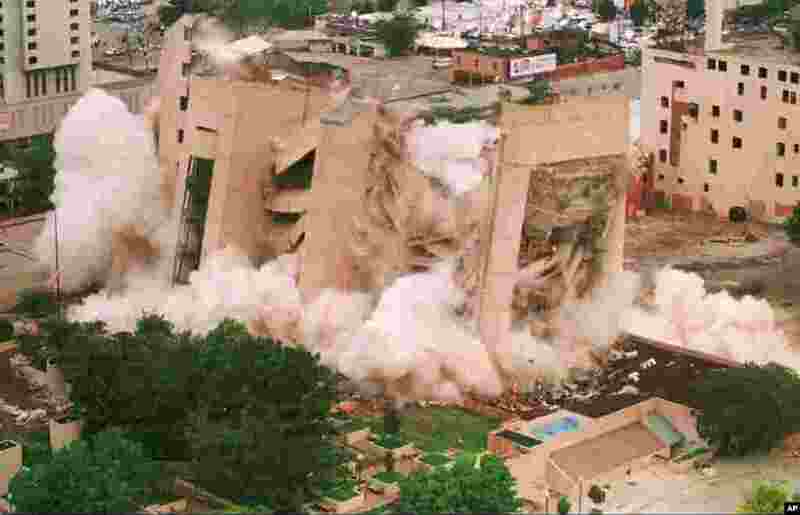 3 FILE - In this May 23, 1995 file photo, the Alfred P. Murrah Federal Building in downtown Oklahoma City falls in a cloud of dust as it was demolished by exposives. The building was the site of a deadly car-bomb attack April 19, 1995. 4 FILE - In this April 19, 1995 file photo, an injured woman holds a child following a blast that destroyed a large portion of the Alfred Murrah Federal Building in downtown Oklahoma City.